I have tried over and over to grow grasses (i.e. 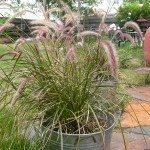 fountain or pampas) and can never get it to start outside, in a domed container or a pot. Why not? My friend says it has to be fertile. What does this mean?